The Association of Directors of Environment, Economy, Planning & Transport (ADEPT) is an umbrella organisation representing local authority county, unitary and metropolitan Directors responsible for ‘Place based’ services. Their remits include economic development, transport and communications, planning and housing and the environment. The 2015 ADEPT Conference – Delivering Real Change in the Places We Live- was held in Manchester on 5 November. 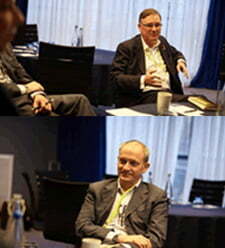 Simon Bandy, Local Partnerships’ Programme Director for Growth and Sustainability, led a workshop at the Conference. The subject of the workshop was the siting process for a Geological Disposal Facility (GDF). Local Partnerships is currently working with DECC, RWM and a Community Representation Working Group to develop the process setting out how communities can take part in the siting of a GDF – a voluntarist process where local communities will be able to express an interest. The ADEPT Conference provided the opportunity to discuss this nationally important project with Directors and senior politicians of local authorities involved in planning, transport, the environment and economy. This conference offered ADEPT members, LEP Chief Executives and other stakeholders the opportunity to learn from members and partners delivering successful projects to transform the places people live and work. There was a wide-ranging discussion on seizing opportunities and overcoming challenges, particularly in the context of devolution proposals spanning the entire country.